Hiding quietly amidst the impressive 2016 movie slate (though really, every year seems to offer up its own exciting mix of franchise blockbusters) is the third installment of the new Star Trek film series. The release of Star Trek Beyond in July 2016 is meant to commemorate the 50th anniversary of the franchise, which was introduced to television in 1966. The production has seen its share of setbacks. After director JJ Abrams abandoned ship for Star Wars over at Disney, producer/writer Roberto Orci took his place and then left the project entirely—or was let go by the studio, depending on how you view "creative differences." 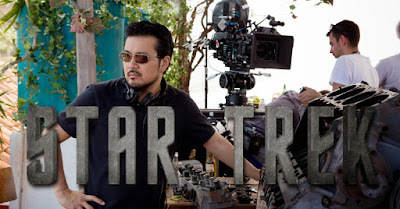 While Simon Pegg helped rewrite the script, Paramount Pictures found a new director in Justin Lin, who recently gave an interview in which he broke down his thoughts about and approach to the new film. Lin talks about how he was a Trek kid growing up and how connected he felt to the original TV show. (Note that this is in direct contrast to former director JJ Abrams' experience with the show.) Lin expresses excitement that he effectively gets to begin the story of the famed five-year mission and talks about the fun he's having creating "whole new worlds and species." "As great as JJ's films were, there's still a lot to be mined from these characters. They haven't really gone on their five-year mission, so what we experienced in the TV show hasn't been touched on yet. That sets up an opportunity for exploration and the deeper you go, the more you are examining humanity. Those are the things that I absorbed as a kid and hope to tap into and embrace and celebrate." Lin has a great grasp not only on what made Star Trek great, but also on how to use that to guide his film. Star Trek's humanity is what made people fans and what kept them around for 50 years. I love his use of the word "experienced;" it's not what we saw on the show, the Klingons, Khan, and tribbles, but what we experienced. The feeling, the tone, the mood of explorers confronting the unknown with good humor, courage, and, well, humanity. Lin's track record as a director bears some weight here, too. Lin helped make the Fast & Furious franchise what it is today, directing the third through sixth installments of the now-venerable (and ever more profitable) series. While his debut film in that franchise saw the lowest box-office take of the three films to date, the fourth doubled the third film's take, and the fifth doubled that. The sixth took in roughly $150 million more than its predecessor as the critical ratings began to climb as well. These are ensemble films with a large cast, as is Star Trek, and while the two franchises are hardly comparable otherwise, this is the kind of lateral studio thinking that could pay off, especially coupled with Lin's love of Star Trek. "Seriously, get on our level, guys." The tease about "new worlds and species" is intriguing. We know Idris Elba is the film's villain, and many assumed (based on teases from Into Darkness and because this is Star Trek) that the Klingons would be the primary antagonists. In a way, I'll be glad if the film ignores this route. This franchise, if it is to succeed and stand on its own, needs to distinguish itself from what has come before. This franchise is supposedly a new and alternate timeline in the Trek universe, but so far it has been mostly an echo of the former. It needs a sound of its own, and it sounds like that's exactly what Justin Lin has planned. Lin's star is on the rise—he was also slated to direct the second Jeremy Renner-led Bourne film, the fate of which is uncertain with Matt Damon and Paul Greengrass returning to the series. With Star Trek, though, if the stars align, Lin could cement himself as the newest "it" director in town. Do Lin's comments fill you with the same confidence I have? Or are you afraid Star Trek is going to get a little too fast? Maybe too furious? Explain yourself below.